Eleventh green, twelfth tee, twelfth green, Augusta National, early 1930s. The Masters tee on the eleventh hole was originally positioned above and to the right of the tenth green, not far from the seventeenth green. The hole ran downhill and played considerably shorter than its measured distance, which was a little over four hundred yards. In fact, until about a decade ago the green was at least theoretically drivable from the members’ tee, which was on the old line, although the shot was blind and called for a powerful fade. 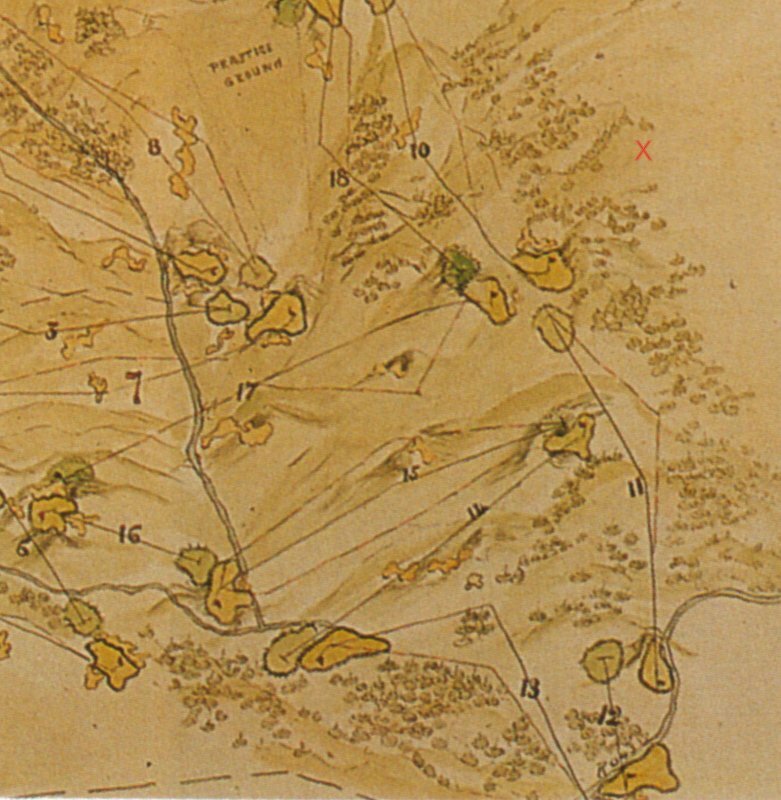 Alister MacKenzie’s original routing, showing the location of the eleventh tee, between the seventeenth green and the old tenth green. The modern tee is somewhere back near the red X in the upper right hand corner of the image. The hole was first changed in 1950, when the club built a new tournament tee, below and to the left of the tenth green. The change was suggested by Clifford Roberts, the club’s chairman and co-founder, and endorsed by Bobby Jones. The change was made both to lengthen the hole and to eliminate a gallery bottleneck between the tenth green and the eleventh tee. “Under the new arrangement,” Jones wrote at the time, “the spectators will have ample room on the high ground to the right of the fairway to observe play, all the way from tee to green, without going on to the fairway at all. It will be substantially the same arrangement as is provided at number 13, where everyone can get a clear view of all shots played without following the contestants down the fairway.” The Masters tee is even farther back today, and the fairway has been reshaped. The hole measures a little more that five hundred yards for the tournament, and when you stand on the tee it looks like a thousand. Eleventh green, 1930s. No pond yet. The eleventh hole’s most conspicuous feature is the pond to the left of the green. Roberts, in his book about the club, which was published in 1976, wrote that the pond had been his idea; Byron Nelson told me in 1998 that it had been his own. “There was already water behind the green,” he said, “because Rae’s Creek ran back there. But not many people went over the green. So I told Cliff that I thought he ought to dam up the creek and let the water make a pond to the left of the green.” (Nelson’s memory that the creek passed only behind the green wasn’t not quite correct. The water also looped near the front left, almost as close to the green as the pond is today—as you can see in the photos above.) The dam was built in 1951. There’s that pond. Look out. 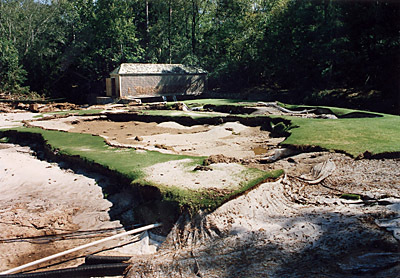 Hord Hardin, the club’s chairman at the time, said they were lucky the flood hadn’t occurred right before the Masters. “We probably would have had to play four sixteen-hole rounds,” he said. The green was rebuilt using data from a 1982 survey, and the bunker and the pond were recreated from photographs. The hole was back in play not just for the Masters but for the Thanksgiving member party, six weeks later. The Colonel, Bobby Jones’s father. In the early years, there was a small pot bunker in the center of the fairway at roughly the distance of a reasonable drive, invisible from the tee. The bunker was Jones’s idea. He wanted the course to have a hazard that could be avoided only with good luck or local knowledge—the sort of seemingly arbitrary booby trap that is plentiful on the Old Course at St. Andrews. 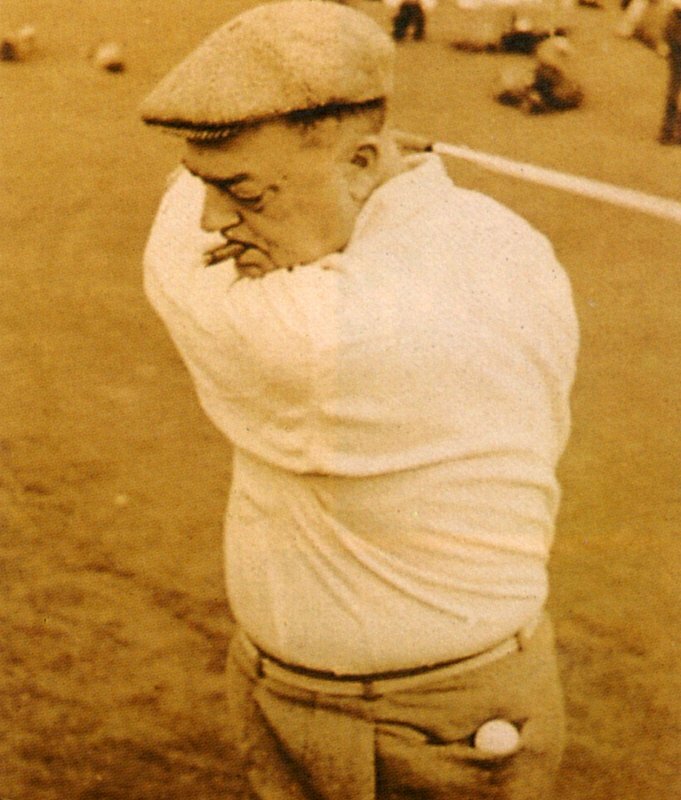 Jones’s father, Colonel Bob Jones (photo above), drove into it during his first round on the course, in 1932, and when he found his ball in the sand he shouted, “What goddamned fool put a goddamned bunker right in the goddamned center of the goddamned fairway?” or words to that effect. His son, who was playing with him (along with Roberts), had to answer, “I did.” The bunker was eventually filled in, though not till many years later. This entry was posted in Architects, Golf Courses, Masters, Masters Countdown, Tournaments, Weather and tagged Alister MacKenzie, Augusta National, Bobby Jones, Byron Nelson, Clifford Roberts, Rae's Creek by David Owen. Bookmark the permalink. Mr. Owen, as a transplanted Brit I’ve always followed the Masters enthusiastically, as for me it’s the best tournament held in the U.S. every year. I’ve also read tons about the history of the course, including a great tome by yours truly, and followed the changes the course goes through each year, ostensibly to make it better not only for the patrons but to test the players who now have the most technological advanced equipment in their hands, yet never managing to rend the course obsolete. I recall reading some years ago of the changes made to number 11 and the old members tee, which I thought was a great short dogleg right with an approach that would probably still cause fits to a player, and remember the old saw from Hogan about never finding him on the green in regulation because, if you did, “I missed the shot”. The map you provided from yonks ago doesn’t show the avenue of pines that the members had to traverse to get to the fairway, and I seem to recall some aerial photographs from some years back that the club had filled in the right side with more trees since. Having never had the privilege of attending the tournament or seeing the course in person, do the members now play from a forward set of tees in front of the tournament tee on this hole, or is there still a members tee still hidden in the pines..? Always love your words regarding this beguiling old game, whether about “Hacker” (real name) and the gang, favourite cheeseburgers, or your opinions about courses played. I agree about the Masters. As for the eleventh: the old members’ tee was still in use when I was working on my book, back in the late nineties. The hole was less than 350 yards from there, and it played much shorter. I’m not a big hitter, but I remember sometimes having just a hard lob wedge for my second shot, from a flat area on the far side of the fairway, just above the pond. It was still a hard shot, because the pond is a black hole, but hitting it wasn’t like trying to sneak past the pond with a fairway wood. Now that old tee has been landscaped out of existence, and the members play from what used to be an alternate tee position, on the same line as the Masters tee but about an nine-iron closer to the green. A few days before the Masters in 1999 or 2000, I played with Jim Furyk and his father, and walked back to the big tee with them to see what the world looked like from back there. That tee was MILES from the tee I played from–and they’ve moved it farther back since then. In fact, one of the most remarkable changes in the course during the past twelve or fifteen years has been the growing separation between the members’ tees and the tournament tees. Even as late as the late nineties, members and pros often hit from what was really just different ends of the same tee boxes, and in the winter, when the course was wet and playing long, visiting pros would often play from the members’ tees so that their tee shots would end up roughly where they would end up during the Masters. Not anymore. In 2000 or 2001, I walked along with Ernie Els and Sergio Garcia while they played a practice round, a few days before the official practice rounds began, and one of the things they talked about was how much farther they were hitting the ball than they had been just a few years before. They didn’t know why–it was just this weird surprising thing, like suddenly realizing they could fly. Thanks for the update, Mr.Owen. And as a P,S., that photo of Jones’ dad ranks up there with Peskin’s image of Hogan at Merion for me…brilliant!